Permian oil production from horizontal wells continued its upward trajectory in June, but productivity per lateral foot is stagnating. 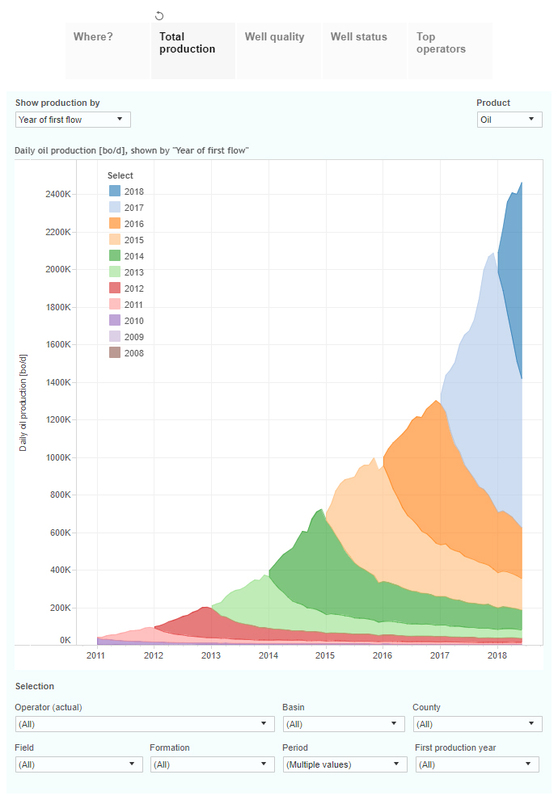 This interactive presentation contains the latest oil & gas production data through June from all 16,770 horizontal wells in the Permian (Texas & New Mexico) that started producing since 2008/2009. Even though data for the last few months is still somewhat incomplete, it is already clear that the Permian set another production record in June, producing well above 2.4 million bo/d from these horizontal wells. The ~2,000 wells that started so far this year already contributed more over 1 million bo/d in June, as reflected in the height of the dark blue area. The most prolific formations are the Wolfcamp and Bone Spring, together good for ~80% of total production (set ‘Show production by’ to ‘Formation’ to see this). 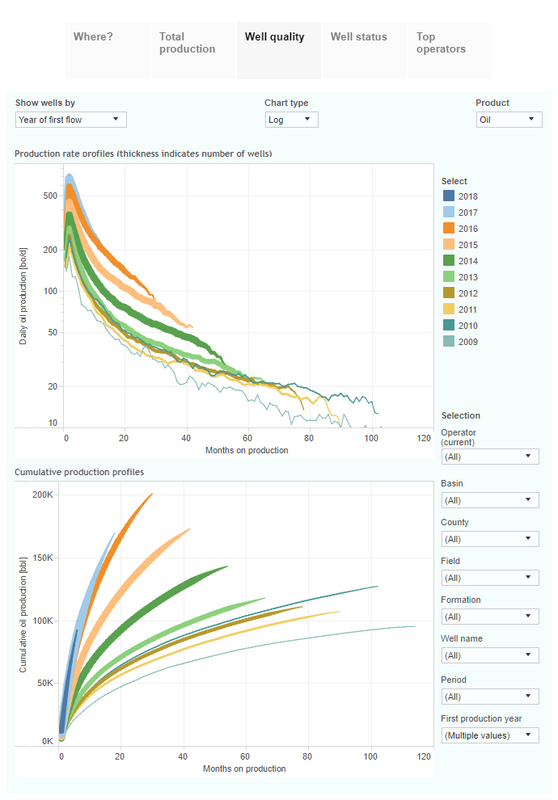 Although output is still rising, with more than 10 wells starting to flow every day, well productivity is no longer increasing as it did between 2013 and 2016, as you’ll notice in the ‘Well quality’ tab. 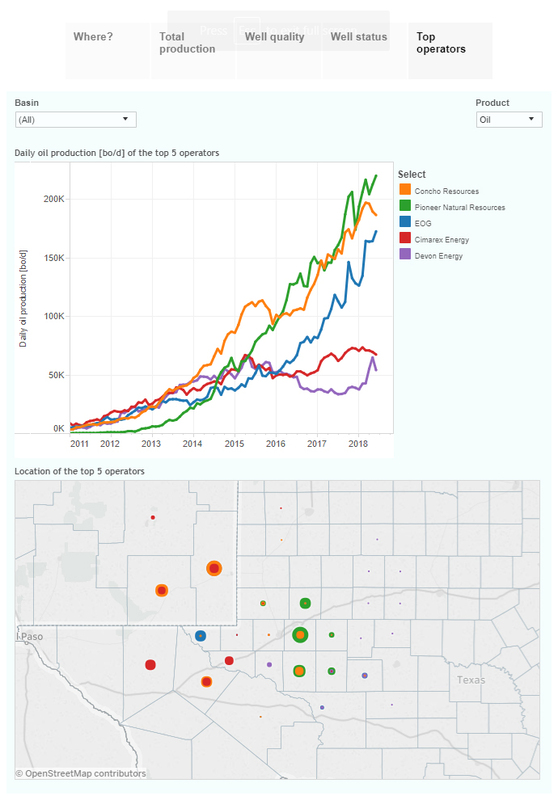 The 3 largest producers here, Pioneer Natural Resources, Concho Resources, and EOG, all increased production at a similar speed since early 2017 (see ‘Top operators’). 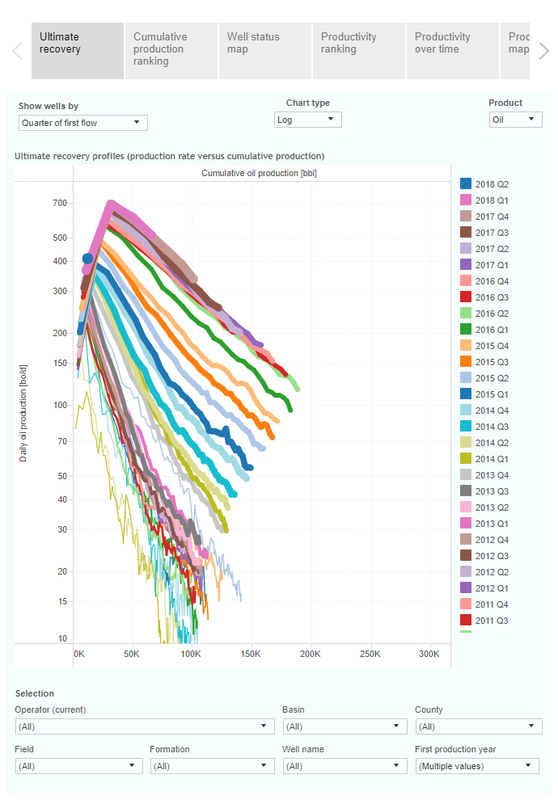 This may explain why proppant loadings have on average not further increased since Q4 2017 in the Permian. 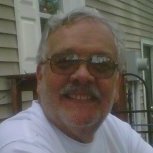 Pioneer Natural Resources, which completed many wells since the end of last year with more than 20 million pounds of proppant, seems to also have scaled down its completions in recent months, based on preliminary data.